NOVI, Mich.—Five Michigan youth will travel to Wisconsin this fall for the National 4-H Dairy Conference, thanks to a sponsorship from the Michigan Milk Producers Association. The top five selected are: Miriam Cook from Clinton County, Grace Sayles from Shiawassee County, Drew Neyer from Isabella County, Dylan Keller from Hillsdale County and Elyse Zimmerlee from Eaton County. 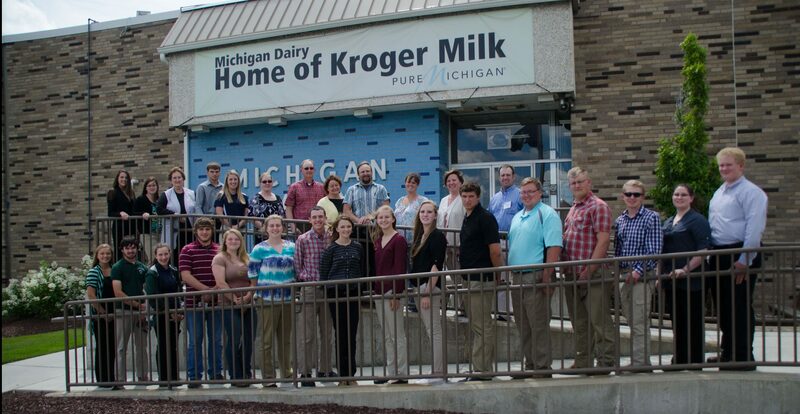 The annual MMPA 4-H Milk Marketing Tour includes a visit to the Michigan Dairy in Livonia, Michigan. Tour participants and chaperones gathered outside the plant on June 27. (Top, L-R) Julia Chamberlain, Bethany Meyer, Mary Sayles, Jacob Armstrong, Miriah Dershem, Barb Keller, Greg Godley, Mary Ellen Wiles, John Broesamle, Leslie Parrish, Sarah VanDyk and Jeremy Beebe. (First row, L-R) Catie Theisen, Drew Neyer, Elyse Zimmerlee, Eric Beebe, Carolyn Delong, Mariam Cook, Jordan Parrish, Jessica Parrish, Chrissy Polzin, Abby VanDyk, Adam Wiles, Will Sharrard, Kyle Godley, Dylan Keller, Grace Sayles and Johnathan Sayles.